Jack-of-all-trades, and the last Kesten in Missouri, Remi oversees the poultry and swine operations, and manages all sales and marketing channels, including our social media. Dave is a family friend, adopted grandfather, and our friendly delivery driver! You won't meet anyone with a bigger heart, smile, or collection of practical jokes. 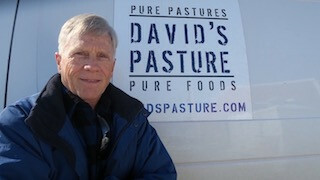 David and Kim began David's Pasture in 2011 after growing tired of corporate America, and the lies in our food system. They began with a single batch of chickens, and the business slowly grew over the course of time. In January of 2019, (most of) the Kesten family moved back to their home state of Florida to be with and care for relatives. Even so, they are still very much a part of David's Pasture, and they hope to eventually begin a second farm there in Bradenton. The Lewie's moved onto the farm in March of 2019, after Kenny left his job at the local sheriff's office. Kenny is now managing the day-to-day workings of the farm, as well as projects, and does custom woodworking on the side. April homeschools their children full-time, and has begun making soap with our tallow (coming soon!) She is also raising a batch of runner ducks and "show chickens" here at the house for visitors to enjoy. The boys are a big help, and right-hands to their dad. FREE delivery for Customer Appreciation Week!